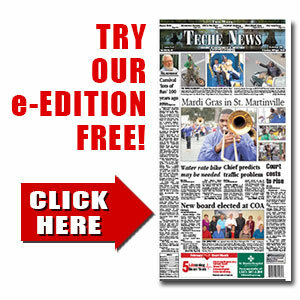 St. Martin Parish arrests for Thursday, March 6 | TecheToday.com | Teche News | St. Martinville, La. Anthony Barthe, 24, Scott; possession of firearm/concealed by convicted felon, illegal possession of stolen things valuted to $500, theft $500-$999, tresspassing (SMSO). Russell Blackwell, 29, Bogaloosa; hold for (SMSO). Lester Broussard, 23, Carencro; hold for (SMSO). Damian Davis, 29, Abbeville; hold for (SMSO). Terrance Felix, 23, Abbeville; possession of marijuana with intent to distribute (SMSO). Axle Frederick, 23, 1100 block of Huval St., Henderson; theft of a motor vehicle, Henderson Police Department (HPD). Jirake Girouard, 34, Duson; hold for (SMSO). Dustin Glover, 27, Bogaloosa; hold for (SMSO). Tony Pollard, 18, Carencro; illegal possession of stolen things valued to $500, theft $500-$999, tresspassing (SMSO). Henry Robertson, 48, 200 block of Ned Ln., Broussard; trespassing, entry or remain in places after forbidden, simple assault (SMPD). Carlos Villarreal, 43, Channelview, Texas; Louisiana Probation and Parole (LPP).